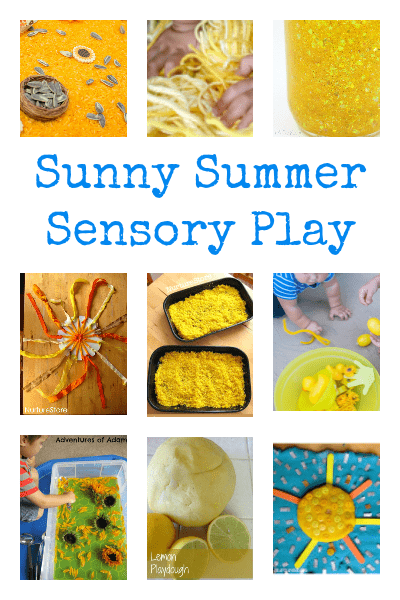 Bring on the sunshine with these summer sensory play ideas for children. It feels like summer is already here in our part of the country this week. Blue skies and sunshine have been putting us all in a good mood. Whenever a new season rolls around I like to switch around the books, art materials and play materials we have on offer, to match the time of year. I think it’s really important for children to have a connection with nature and to follow the cyclical rhythm of the year. And I also know that refreshing what we have available can spark new ideas, boost creativity, and generally get children excited to explore and learn. So, to herald the coming summer months, here’s a super, shiny new collection of ideas that celebrate all things sunny and sensory. You’ll find summer sensory play ideas that are great for babies, toddler and beyond so everyone can join in and start exploring.